3 What Does a Brake Controller Do? 3.1 Is a Brake Controller Necessary? 4 How do Brake Controllers Work? 4.1 How to Use Trailer Brake Controller Operation? If you use a trailer or tow an RV much with your car or truck it can be very rough on your vehicle’s brakes and create some unsafe stopping conditions too. Most of the stress and strain on your car or truck when towing a trailer comes when braking. The heavier the load you are hauling the more your car is impacted during braking. Many trailers these days come with their own brakes but they do not always actuate in a helpful way when you need to stop. That’s when having the best brake controller installed on your trailer can really help. That’s what this article is all about. It will supply you with good information about brake controllers. In it, you will find some excellent brake controller reviews. There will also be loads of very useful information to use when shopping for a new brake controller. When you are done reading, you will be armed with all of the information you need to make a really good brake controller purchase. 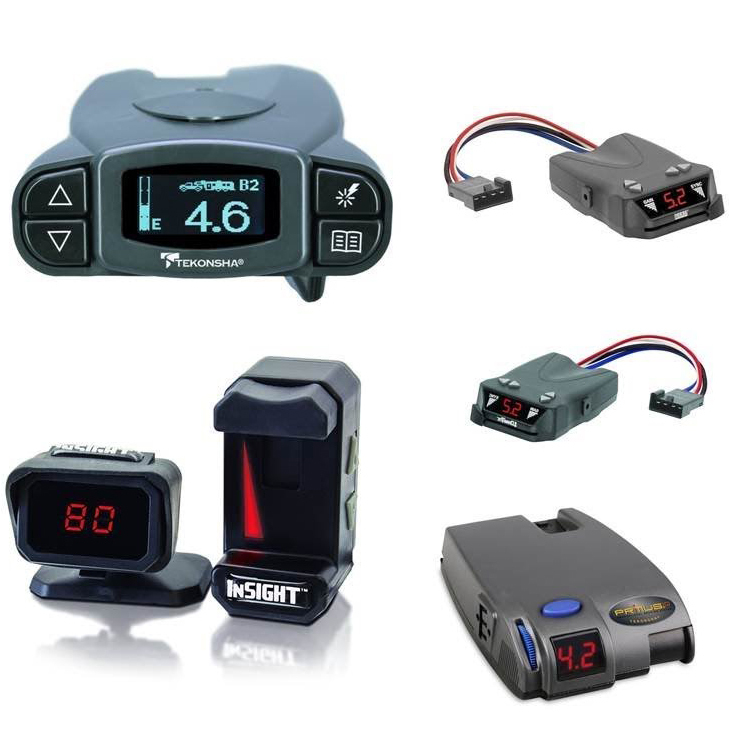 We will review 6 top-quality brake controllers on our review list of the best models. Three of those are made by Tekonsha. That right there should tell you how well this company designs their brake controllers. This proportional brake controller from them is an exceptional one. It will help you brake much more efficiently when towing even heavier trailers or RV’s that have electronic braking systems on them. This brake controller has everything you could want on one. It has a digital readout that shows the voltage going to the trailer brakes when stopping. There is even a ‘boost’ feature that can be used to stop heavier trailers more quickly. It also can be mounted in several different ways and the mounting hardware comes in the package. This another quality proportional brake control from Tekonsha. It has many nice design features built right into it. It fits a large variety of vehicles and its plug and play style hookup allows it to be used on multiple trailers and RV’s equipped with electronic brakes. 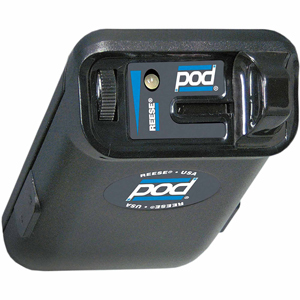 It even has a boost button that can be activated for use when towing heavy loads. Other great features include it’s easy to read LCD display. The LCD display shows several important diagnostics. These include brake output voltage and a system warning when there is a no brake situation. It can even be mounted so it swivels 360-degrees. There is also a heavy nylon storage case that comes with it to protect it when not in use. 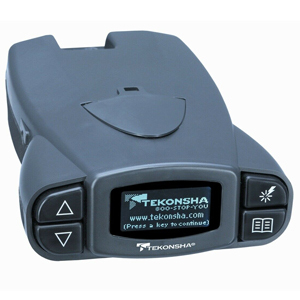 Here is an electronic brake control from Tekonsha that not only works great but is affordably priced too. It’s a proportional style brake controller that will really ease the wear and tear on your braking system when towing. It includes a boost feature that will give you the extra stopping power you need when towing big loads. This brake controller does everything automatically when it comes to trailer braking pressure. It has a decent LED display that reads out several different diagnostics. These include voltage to the trailer brakes when your brakes are applied and an indicator that the unit is working properly. It even works when in reverse. This brake controlling mounts by snapping into the dash and the necessary hardware is included. Draw-Tite has been a leader and hitch and receiver manufacturing for many years now. That’s why it’s not surprising that they have designed a very good time activated brake controller like this one. It features a wide angle LED display that will supply you with diagnostics such as brake voltage, overload, and open ground. This Draw-Tite brake controller puts you in control of your sync and output voltage to your trailer or RV brakes. It has handy push bottoms built in to make this operation simple. This brake control unit mounts easily on a wide variety of vehicles and it can also be set up to plug-n-play in more than one tow vehicle. 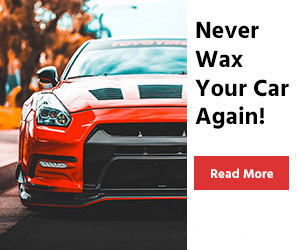 It’s protected by a limited lifetime warranty from the manufacturer. Here is another manufacturer that has made a big name for themselves in the hitch and receiver manufacturing industry. They have proven for many years that their towing accessories like this one really work. This is the only pod style time activated brake controller on our countdown of the best ones. Its ultra-affordable price point means there is no reason that anyone should not own a brake controller for their trailer. 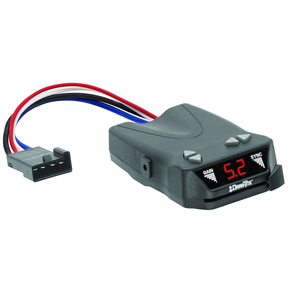 This brake controller with LED display and solid-state electronics works on one or two axle trailers or RV’s. There is even a manual override built into this brake controller. Its rugged chassis mounts easily on just about any type of towing vehicle. All the mounting hardware necessary for installation is included. This is a very nicely designed proportional style brake controller. It will give you the smooth stopping power you need when towing a trailer in town or on the open road. Curt Manufacturing describes the special technology that’s built into it as triple-axis, motion-sensing accelerometer. It features a full 9 levels of calibrated sensitivity and these kick in automatically depending on the amount of pressure applied to your brakes. There is a big LED display built into it and all the necessary mounting bracket hardware is included. This unit comes backed up by an excellent limited lifetime warranty too. 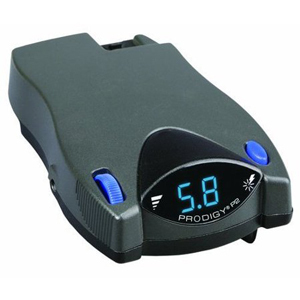 Proportional brake controllers cost more but work great when braking a trailer or towed RV on both open roads and around town driving conditions. These units are inexpensive but best used for braking when you predominately drive under open road conditions. You want your brake control main unit to be made of durable materials. This is especially true if you will be using it in multiple tow vehicles. Look for control units that are made out of durable polymer plastics, corrosion free metals and other tough and environmentally resistant materials. If your brake control unit comes with a protective storage bag for when not in use, that’s helpful too. 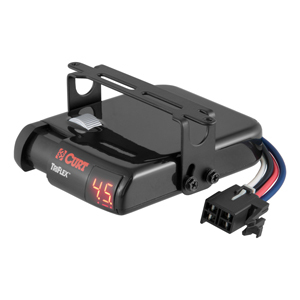 The best brake controllers will have an LCD or LED readout built into them. These help by telling you your brake controller is working properly and give you diagnostics too. They inform you of such things as the voltage going to your trailer brakes, whether the unit is operational, and they alert for overload and open ground conditions too. Here is a mistake people make all of the time when buying a new brake controller. They have a 4-axle trailer and buy a brake control unit that will only work on up to two axle trailers. That means they have just bought a brake controller that is useless to them and needs to be returned. So make sure that any brake controller that you buy is able to handle the number of axles you have on the trailers that you will use it with. Preferably, the brake control unit you purchase will come with all the necessary hardware to mount it. That certainly will help make the installation process be less of a headache. If it has more than one bracket so the brake controller can be used in other vehicles’ that’s great too. A brake control unit that mounts so it swivels is a big bonus too. Wiring can be very tricky when it comes to installing any brake controller. If your brake controller does not come with a vehicle specific wiring harness it should at least have wiring leads that can be spliced to make it work. Having one of our top-rated multimeters on hand will help you greatly when wiring your brake control. 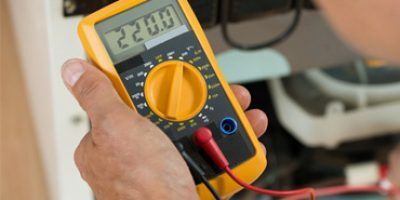 For a piece of equipment that is generally no so expensive, you can find one with a good warranty. Many of the units on our top review list come with outstanding limited lifetime warranties. As a general rule look for a brake controller warranty that covers the unit completely for the longest time possible. These are the best all-around driving brake controller of the two main types. That only makes sense then that they are the more expensive of the two also. They are very popular because as the name suggests, they apply equal pressure to your trailer brakes that are proportional to the amount of brake pressure you apply when braking the tow vehicle. Inside of these controls, there is a piece of equipment called an accelerometer. That is what makes these braking units work. 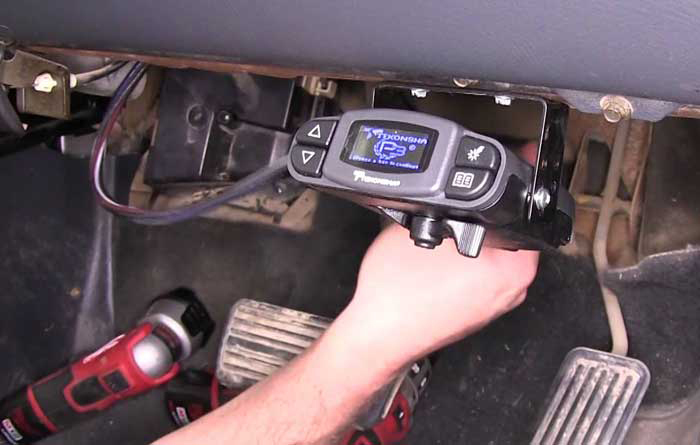 This accelerometer gauges the momentum of the trailer and the tow vehicle when braking and adjusts the brake pressure applied to the trailer accordingly. This makes for some extremely smooth and safe braking even when hauling heavier loads or an RV. They are generally a little bit harder to install than time-activated brake controllers. This is especially true if your tow vehicle does not have a pre-installed factory towing setup. This type of brake controller does not operate quite as smoothly as proportional brake controllers do. That’s because they are not as complex and sophisticated as inertia-based brake controllers are. Don’t be fooled by this though because they still work well. These types of brake control units are also much less expensive and easier to install than their proportional brake control counterparts. They work based on how the user sets them. Each one usually allows the user to control the gain when braking and the synchronized braking level. Time-activated braking controls are very effective once you get them adjusted properly to your trailer and load weight. If you do a lot of starts and stops hauling this is probably not the type of brake controller you want to install on your tow vehicle. They work best in conjunction with trailers that are used in more open road conditions. You do not need to pay more money for a proportional brake controller if you only haul short distances or light loads. *** Please Note: Any type of brake controller you have is much better than no brake controller at all. They help make braking a trailer or RV much safer and help reduce wear and tear on the braking vehicles. As towed trailers kept getting bigger and bigger over the years someone finally got wise and put brakes them. These improved the stopping time when towing a trailer for sure. The problem being is that stopping with these initial brake systems was choppy and tended to lock up the wheels. This made braking unsafe at times. That’s when someone decided to design a brake controlling system. This made braking much smoother, faster and safer when towing a trailer equipped with brakes. It also saved a significant amount of stress and wear on the brake systems of both the vehicle and trailer. That really describes what brake controllers do to a tee. Is a Brake Controller Necessary? This is a very good question and pretty easy to answer. If you have a larger size trailer with brakes and haul some heavy material in it, you would be very wise to add a brake control unit onto the tow vehicle. This will save wear and tear on your vehicle and make braking safer. Some states even require brakes and brake controllers to be installed on trailers over a certain weight. If your state is a state that does not require brakes and brake controllers, what should determine if you need to install them or not on your trailer? Once again a good place to start is with weight. Any trailer or towed RV that is over 1650 pounds (750 kg) weight empty really should have brakes and a brake controller on the tow vehicle. It will just make stopping faster and safer when hauling big loads. You can also go by the type of trailer you are hauling. For example, boat trailers are fairly light but get very heavy once a boat is resting on top of them. So get a brake controller if hauling a boat. Just about any size RV, horse trailer, dump trailer or 2-axle trailer really should have brakes and a brake controller to run those brakes. The two types of brake controllers that we cover in this article on the best ones work completely different. A proportional brake control device is pretty self-sufficient as far as braking goes once you install it. That because it’s more like a sensor than a control. As much as you apply pressure to the tow vehicle’s brakes it provides an equal amount to the trailer you are towing brakes. You can boost this by hitting a switch or override it but not much else. Think of the sensing device inside them for the tow vehicle’s braking as a pendulum; the further it swings from the center the more pressure that’s applied to your trailer brakes. 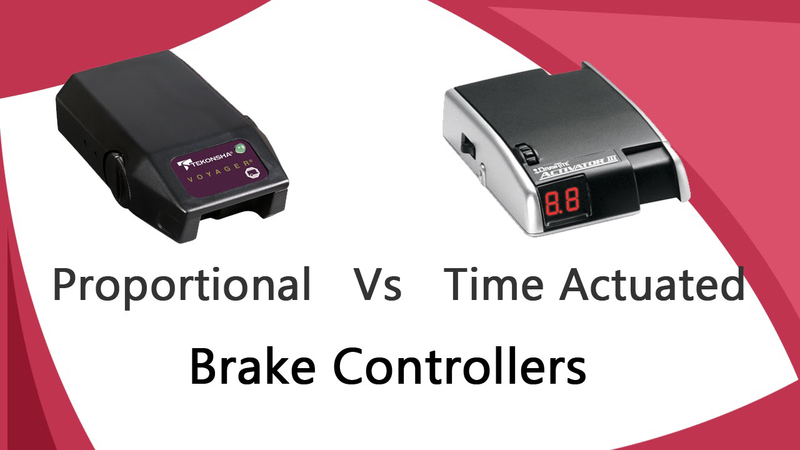 Time-activated brake controllers are much different. The user is the one who has to make the adjustments on these. The driver will set a predetermined amount of pressure to go to the trailer brakes each time the brakes on the tow vehicle are applied. As you can imagine stopping is not as smooth always with time-activated brake controls. You might have guessed with their name there is a very slight time hesitation from when the tow vehicle brakes are applied to when the trailer brakes are applied. How to Use Trailer Brake Controller Operation? No matter what style of trailer brake control you are using they operate pretty much the same way and with the same objective. That is to brake for a tow vehicle and trailer with about the same amount of braking pressure. Proportional brake controls do this automatically and it’s up to the driver to do this with time activated brake controllers. This similar braking pressure on the tow vehicle and the trailer helps to create smooth braking. That is the key to safe, effective braking that does not lock up the wheels on the trailer. A wheel lock-up when braking makes the trailer go out of control to various degrees. That is certainly something no person towing a trailer ever wants to deal with. Installation of brake controllers can be a little tricky. This is especially true for the wiring and if you have a vehicle that has not been factory prewired. The best advice we can give you here is to make sure you follow your supplied instructions very closely. Mounting is usually the most straightforward part of the installation of any brake controller. As a matter of fact, most manufacturers include all the brackets and hardware necessary for mounting in the kit. Many will even include second and third mounting brackets in the kit for using the brake controller with multiple towing vehicles. What’s the hard part of any brake controller hookup? If you guessed the wiring you would be 100% correct. That’s because most brake control kits come with generic wiring that has to be spliced together with the trailer’s wiring to work properly. This can be a tedious task trying to identify the right wires to splice together. That’s why we recommend ordering a vehicle specific wiring harness from the manufacturer if they make one. It will make the wiring phase of the project go simpler and is well worth the money. To be honest there is not a lot of adjustments you have to make with a proportional brake controller. You might have a break booster switch you need to activate when towing heavy loads. There also is a roller type switch on some you can adjust the calibration of the brake control unit with. Other than that the controller pretty much reacts in response to how hard you brake. Quite the opposite is true with time-activated brake controls. You as the user will have several adjustments to make to get them to help you brake fairly smoothly when towing. If you look at the controller itself you will see several buttons. These buttons will help you adjust the synchronization between the tow vehicle and trailer. They will also help you set the amount of braking gain. You may have to adjust these and other settings several times until you get them right. Question: I am getting ready to install a new brake controller. What are some of the most common mistakes people make when installing them? Answer: Wow- good question. There certainly are a lot of places where someone can make a mistake installing a brake control device. Here is a consensus of the 5 most major mistakes people make when installing a brake controller. Basic wiring – by far the most common mistake because it’s the most difficult installation task. Not tightening components enough/Loose screws and fasteners. Mounting on a too thick area of the dashboard. Running the power through a relay (bad idea). Poor splices or connections with the wiring. Question: Is a proportional brake controller or time-activated brake controller better. Answer: This is a pretty easy question to answer but with an asterisk. 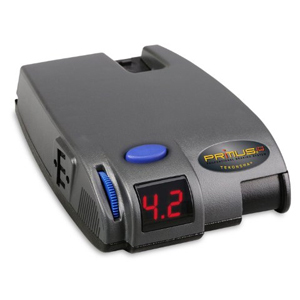 Without a doubt, you will brake much smoother with a proportional brake controller. Now that we said that, you may not always need the best (and most expensive) type of brake control device. For instance, for short hauling using a trailer, it may not be worth investing in a proportional brake control system. The same can be said if you haul using a trailer in a rural setting or mostly on highways. Question: What is the best way to set a time-activated brake controller? Answer: As you know by now, you pretty much have to totally set up a time-activated brake controller yourself. That’s just how it works for their low price. You may have to set the brake gain and synchronization several different ties until you get it right. The best way to do this is to set it in a certain position and then go for a short drive and test the brakes. Adjust as necessary and take another test drive. Do this until you get it right. Once set initially you should only have to make slight adjustments based on load weight. Question: If I am a good and careful driver is it ok to not use a brake control device? Answer: Easy answer. No, if your trailer is heavy enough that the manufacturer put brakes on it or your trailer is over 1650 pounds empty. It does not matter how careful or slow a driver you are. You simply cannot stop a heavy trailer quickly enough if a child runs out in front of you and you don’t have a brake installer controlled. Knowing this why would you ever want to take a chance and not have a brake controller installed? Even the absolute best model controllers are often found under a $100 and you can install them yourself. Feel free to use our homepage as a car accessories checklist! Without a doubt, if you own a trailer with brakes, the best brake controller will help you stop smoother and more safely when towing that trailer. There really is no good reason not to own one of these devices if you have a trailer. They are fairly easy to install, not very expensive and work on all size trailers. So if you do any hauling with your trailer more than just short distances, we highly recommend purchasing a brake controller to use when towing. What is the best way to find a brake controller that will work well for you? Start by using the advice in our handy brake controller buying guide here. You can never go wrong purchasing a model that is found on our list of top brake controller reviews either. 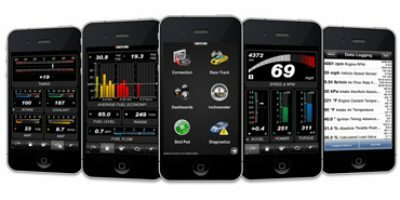 There is enough good advice and information on brake controllers in this article to steer you toward making a good brake controller purchase.